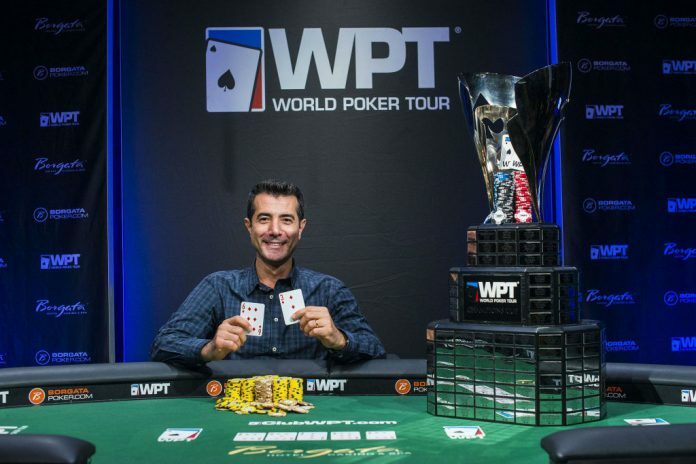 42-year-old Erkut Yilmaz started the final table of the World Poker Tour Borgata Poker Open with the chip lead and over the course of six hours of play fought off TK Miles to add his name to the WPT Champions Cup while picking up a $575,112 payday. Anthony Maio, the top-ranked online poker player in Pennsylvania, made the final table with just nine big blinds and got the chance to play just 11 hands. Down to just six big blinds, Maio moved all in from UTG with only to have Austin Wentling wake up in the big blind with . Maio got no assistance from the runout and was eliminated in sixth for $121,697. Liam He had the second shortest stack when the final table began on Friday night and managed to outlast just Maio. Action folded to Aleg Shnaider in the small blind and he raised to 400,000 with before He moved all in from the big blind with and Shnaider called. The flop put Shnaider way ahead and he stayed there through the turn and river to elimiante He in fifth place. From UTG, Miles raised to 500,000 before Wentling moved all in for 1,725,00 from the button. Yilmaz defended his big blind and Miles called. Yilmaz and Miles then checked through the runout before Miles tabled to force Yilmaz to muck his hand. Wentling turned over and was eliminated in fourth place for $211,562. Shnaider and Yilmaz battled 15 hands later in a blind vs. blind spot that spelled the end for Shnaider. Miles raised to 500,000 from the button, Shnaider moved all in for 6,000,000 from the small blind and Yilmaz called from the big blind. Miles folded and Shnaider got bad news when he showed and found himself up against Yilmaz’s . The flop gave Shnaider some outs to a chop but the turn and river both fialed to help him out and he was eliminated in third place. Yilmaz began heads up play with almost 60% of the chips in play but he and Miles traded the chip lead back and forth over the next 55 hands before Yilmaz finally eliminated Miles. Miles completed his bet and Yilmaz checked to go to a flop of . Yilmaz checked to Miles who bet 800,000 and Yilmaz check-raised all in forcing Miles to a decision for his tournament life. Miles called and showed for top pair while Yilmaz tabled for bottom pair and an open-ended straight draw. The turn gave Yilmaz two pair and Miles was eliminated in second when the river failed to improve his hand. Just days after winning the 2018 Poker Masters Purple Jacket, Ali Imsirovic finished ninth ($57,510) while PokerStars Ambassador Maria Konnikova finished 20th ($24,695). Other well known players to finish in the money include Alex Fitzgerald (39th – $14,769), Jared Griener (84th – $7,309), Joe McKeehen (89th – $7,309), Daniel Weinman (100th – $6,393), Ryan D’Angelo (101st – $6,393), Jared Jaffee (117th – $6,097), Anthony Zinno (130th – $6,097) and Darren Elias (131st – $6,097). The next World Poker Tour stop actually began on Friday in Hanover, MD. The WPT Maryland At LIVE! Casino runs September 21 – 25 and has a $3,500 buy-in.